How to control bamboo. Stop bamboo spreading. Bamboo runners taking over. Clump formers spreading out, bamboo spreading, bamboo gone mad. Control bamboo, bamboo removal. Bamboo eradication. From the ground up has had several cases through May and June of bamboo plants that were otherwise well behaved clumps spreading wide by sending out runners. This was when it was relatively hot and notably bereft of rain. The symptom and prevailing conditions are not unrelated. The plant is spreading out in search of moisture, but you can stop bamboo spreading. This happens with otherwise well behaved clump forming plants as well as the more notorious running forms, and can have taken over the garden before you realise how bad it is. In some forms the runners are strong enough to push through paths and tarmac, and to undermine walls or other structures with shallow footings. Bamboo can be managed to look smart and effective. When you think about it, it makes perfect sense. There is no water local to the plant, so it looks for more to sustain itself. At the same time it may drop leaves to reduce transpiration. The result in your carefully planned border is bamboo shoots where you don’t want them and brown paper leaves adorning everything. You can take preventative and corrective action to stop bamboo spreading. If the reason for sending out runners is to find water, then pre-empt it by making sure there is adequate supply. That does not mean just leaving a hose pipe on next to it, but also reducing its requirements. This involves thinning out the main clump, removing up to one third of the stems so that it needs less to survive. This exercise also keeps the clump tidy, as any dead or damaged stems can come out at the same time. 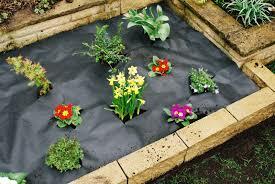 You can also concentrate water at the plant by mulching,. This wil both maintains moisture close to the plant and helps to prevent evaporation. You can also employ various physical and mechanical barriers, all of which are effective. 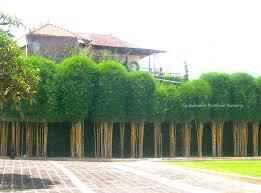 But they may not be conducive to the easy care regime bamboos propose. If the bamboo has already sent out runners you have a choice to make. First is to take a long view and starve out runners. Just like any other weed if you reduce its capacity to absorb energy it will eventually weaken and die. So keep cutting off the stems as they show themselves. Or you can take more radical action. They can be cut out, or even just pulled out. They should come out with the assistance of a fork or lever such as a pick axe. If stems are rising in places that can’t be dug or disturbed, within established borders, through a priced rose bush or such, then this is what to do. Bamboo Botanicals has further useful information. Let the stem grow until it has a width of 6mm or more. Then cut of the stem leaving a portion behind. To this stump apply a glyphosate weed killer. With larger stems the liquid will sit inside the hollow stems and kill the runner. The treatment may need repeating. There is always the danger that it will knock back more than just the runner you want rid of. So in some cases dig around the runner to expose it and cut as close to the main plant as possible. Don’t spray weedkiller around the plant. It takes much more chemical to effect a result than letting it soak through the stem. Once the stem and runner are dead they become quite tough and can usually be pulled out. In this case prevention is better than cure, and the argument for a maintenance regime is strong. It takes only a couple of hours per year to keep the plant neat and limit its need to go searching. It may seem like the simplest thing in the world, but a few simple ideas potting up plants for patio or indoors will make watering easy. Here we discuss how to water pots. We all like to have the bright colours and exotic foliage offered by summer bedding and annuals. But looking after them when there has been no rain, or you’re away for a week or more can cause concern. After all, they are not cheap, and who wants a pot of dead plants on their doorstep? When planting, consider the shape of the pot. 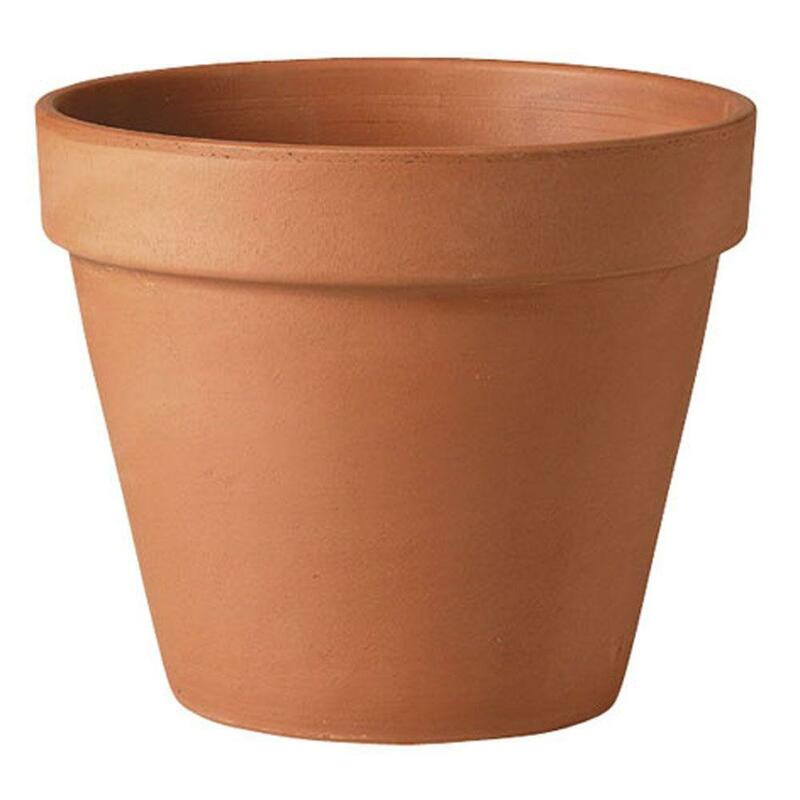 A “standard” or traditional flower pot, be it clay or plastic, has a lip at the top. This usually represents about one tenth of the pot volume. And quite by chance, the volume of water required to soak the pot. It doesn’t matter what size the pot is, the proportions are the same. So when you are potting up the pelargoniums and cannas, plant them below the lip, and pack the soil or compost only to that level. Water it in by filling the pot to the rim with water. That water should have reached the bottom of the pot. A regime that applies water before the compost is bone dry will allow that to be reliably repeated. Mostly. Water won’t be able to easily penetrate the soil if its dried out. Or just run down the side of the pot where the soil has contracted. A simple test is to stick in a pencil or finger to a depth of two inches. If soil sticks to it then it has water enough for now. If nothing sticks then its time to water. It is also possible to break down the dry surface tension by adding washing up liquid, just a drop will do. That will help stop a tension forming and allow the water to soak in. 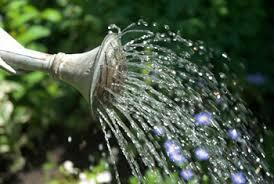 Watering of pots can be done weekly, if one properly; more frequently in severe heat or the prolonged absence of rain. 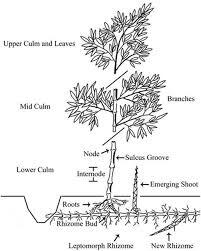 Frequent shallow watering, in pots or in the ground, will stimulate the roots to grow to where the water is, near the surface, rather than deep into the soil where you want them to be. Water running out through the drainage holes tells you its done thoroughly. When you water also matters. Water in the morning or later in the evening, preventing the immediate evaporation that could occur in extreme heat. The reason most usually given was that leaves may be scorched in the sun, the water droplets magnifying the sun. This myth was debunked by tests as long ago as 2010. Fill your pots to the correct level with compost; leave room for water. Test the soil to establish if water is needed. Water less frequently but more thoroughly. If the pot has dried out, apply water in parts gradually soaking the root ball enough for the water have got all the way to the bottom pf the pot. If need be add washing up liquid to the water.